The besiegers have become the besieged. Caesar’s army stands upon the brink of annihilation, caught between two enemy armies. Ramparts have been constructed, but they must also be defended. The centurion Lucius Oppius believes he will be part of the defence, but Caesar has other plans for the former standard bearer. Oppius is ordered to venture north of Alesia to capture Vercingetorix’s war chest of gold. He will be accompanied in his mission by one of Caesar’s agents, the beguiling Livia – the centurion’s former lover. As Caesar and Mark Antony face a battle for their lives outside the walls of Alesia, Oppius will have to fight against the odds to find and secure the gold. Yet will completing the mission this time exact too high a price? 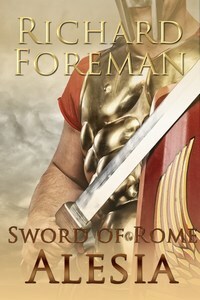 The Sword of Rome series brings together history and adventure in stories which will appeal to fans of both Simon Scarrow and Bernard Cornwell. The bonus story of Raffles: The Gentleman Thief by Richard Foreman can also be found at the end of Sword of Rome: Alesia.